Do you provide a maintenance kit for a Kyocera Ecosys FS-9130DN? Thank you for your question. Unfortunately, we only have the toner cartridge available for the Kyocera FS-9130DN printer. Please accept my apologies. 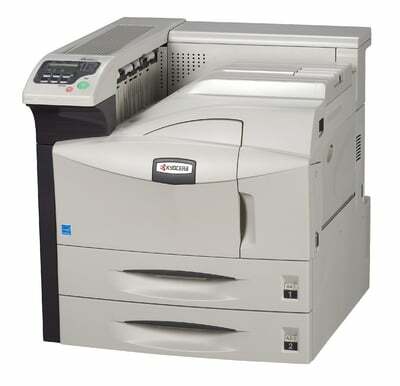 The Kyocera FS-9130DN is aimed at medium-sized offices that need an expandable and reliable A4 or A3 departmental printer. It is very secure and easy to use, while fast print speeds ensure high productivity for workgroups. The Kyocera FS-9130DN A3 mono laser printer includes built-in features that help streamline workflow and save resources, but it is expensive and lacks colour printing capabilities. This is a bulky and heavy machine that measures 615mm tall, 646mm deep, and 599mm wide, and weighs 68Kg with the toner installed. The FS9130DN Kyocera printer runs on 64MB of memory (expandable to 576MB). Two 500-sheet universal paper trays are included in the base unit of the Kyocera FS 9130DN printer, but additional paper feeders can increase the maximum paper capacity to 4,200 sheets, while the output tray has room for 500 sheets. A 600MHz PowerPC 750FL processor is integrated into the device, while standard interfaces include high-speed USB 2.0 and FastEthernet. It is network-ready and offers two-sided printing. The Kyocera FS-9130DN monochrome departmental printer is easy to maintain and it has long-life components. A two-year warranty comes with the product as a standard. It is possible to print PDF files directly from a USB flash drive. Up to 100 department codes can be programmed into the black and white Kyocera FS-9130DN printer so IT managers can easily control and track printer use. A total printing capacity of 40,000 pages is expected from the original Kyocera FS-9130DN toner replacement cartridge which helps to keep productivity up whilst minimising operational costs. It needs a more comprehensive control panel with a larger display screen. The Kyocera FS-9130DN does not print in colour. This heavy device also requires a large installation space. The high initial cost of the FS-9130DN printer could be a problem for those with a limited budget. Upgrading for additional memory and paper capacity means spending more for the already expensive device.